Bellbird Disaster Proto Team, courtesy of Barry Howard. The passing of the Mines Rescue Act in 1925, was a reaction to the accumulated death tolls of the disasters. It was based on trade union policy and placed safety regulations on the coal industry. It established purpose-built rescue organizations and stations to protect miners lives and mining property. 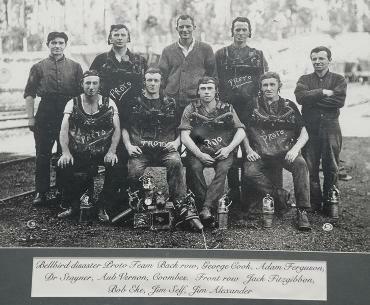 The first mines rescue facility in the Hunter Valley was the South Maitland Mines Rescue Station. They relied heavily on the Proto apparatus which allowed them to enter mines where the air contaminated with deadly gasses. Geal, Rhonda. The First Rescue Station: the development of a mine rescue organization on the Northern District Coalfield of New South Wales. Newcastle: Newcastle Region Public Library, 1989. Print. 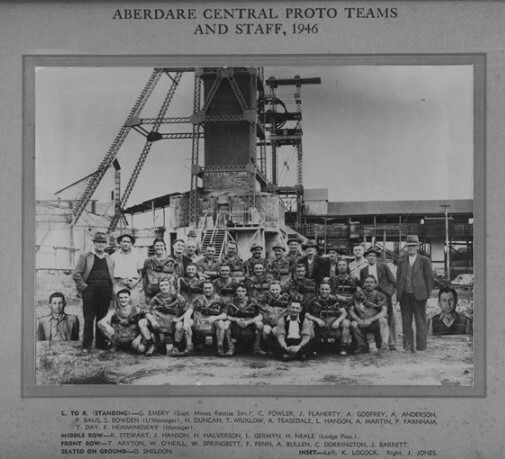 Aberdare Central Proto Teams and Staff, 1946. Courtesy of Barry Howard.